For centuries, Italy's marble carvers have been perfecting their sculpture game. Blood, sweat and tears go into their masterpieces, gracing museums and galleries worldwide. Their craft, however, is now under threat. Ish. 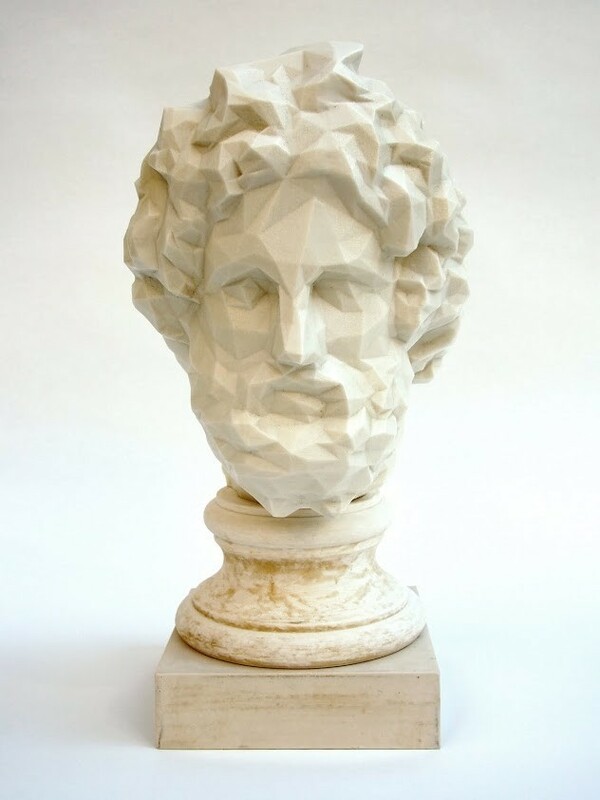 Enter Zachary Eastwood-Bloom, the ceramics specialist who founded East London’s Studio Manifold, who uses 3D printers to create sculptures that would ordinarily take years to create – as seen in his RA Edition Asklepios (2014). Rather than showing the raw, printed object, Eastwood-Bloom fuses the past and the future in his contemporary sculptures – using the 3D prints as a mould that are then used with traditional materials, such as clay and bronze. On the eve of London's 3D Print Show next month, we caught up with Zachary to find out more about why 3D printing is the catalyst for his artistic process and how to exhibit art he's never even seen or touched. Why did you start working with 3D printing? Zachary Eastwood-Bloom: I went to the Royal College and I’d only ever done ceramics and model making. I thought while I was there I might as well try the 3D printers. It just started from there. I didn’t really want to make anything that I could make by hand because it seems a bit pointless. I found this really old computer program, some Beta test thing that had just been abandoned on the internet, that used algorithms to create landscapes. I thought it'd be really interesting to make them rather than keep them in this digital sphere. So you used the 3D print as a cast? Zachary Eastwood-Bloom: Exactly, I used that as a model and poured plaster into it, and because it’s a fairly simple surface I can get two out of that, so I can get the opposite as well. It was kind of a way of maximising the potential of the piece. I try to do that a lot actually because 3D printing can be very expensive. Because I came from a ceramics background it was a catalyst for me to explore with loads of different materials. So they’re just a means to an end? Zachary Eastwood-Bloom: It’s very rare that I would show a 3D printed object. I’ve actually only made two things that are 3D printed that I’ve shown. One is a 3D printed frame and I grew borax crystals over it. So actually, it’s really just an armature for the crystals to grow over, and kind of fill out the facial features. I’ve done one other piece, which is quite interesting. At the end of last year, two guys in Toronto got in touch with me and said that they wanted to put me in a show called Hand in the Machine, which is about digital technologies. So I went to the British Museum and 3D captured some Greek vases and played around with them on my computer, and then what I had was this 3D file. To get around any kind of costs for shipping and duty costs I just emailed them the file and they printed it in Toronto, or North America or somewhere, and exhibited it. So I’ve never actually seen it in the flesh. Zachary Eastwood-Bloom: Quite strange. Even though I work on screen a lot, you often don’t get the feel of a piece of work until you get it in the flesh really. You can manipulate it and orientate it from every angle, but you don’t really get to know what it is until you’ve got it in your hands. This piece is on its way back to me now, so I will actually get to see it. It’s somewhere either in the Atlantic or some kind of storage place somewhere. I find that quite exciting that I was exhibiting a piece that has my name on it and I’ve never seen or touched. I thought that was quite interesting. Was that why you started using 3D printers? Zachary Eastwood-Bloom: I wanted to experiment and push myself a bit, and because I had the opportunity to try these things at RCA. It's made the way I work much more efficient, and made me do things that I wouldn’t normally do. But I think everything is getting a little bit cheaper as well. With the landscape I did, I got a computer program that turned that into sound, so you read it across and it becomes a sound piece. So for me it’s more than just 3D printing. It opens up much wider possibilities. Can you see the use of 3D printers being the future of your sculptures? Zachary Eastwood-Bloom: At the moment I see it as another tool for model making. I like to transfer it into materials like wood or clay, or more natural materials rather than plastics, for me. A lot of my work is about that biting point between the digitalisation of materiality. So that’s what I’m interested in, that blurring space, or the increasingly blurring space in terms of socially as well as in terms of making. Inititally it was about trying to assimilate an idea of digitalisation into the processes that I’d used before which were exclusively hand made, and using clay. Complete polar opposites really. What do you see the future of 3D printing? Can you see a 3D printer in every home? Zachary Eastwood-Bloom: I think the more you read about it, you can see it’s going to develop quite significantly. Multi-material printing. They even talk about stem cell printing food, so it could potentially change things quite a lot. It’s hard to predict whether there'll be one in every home but I don’t think; not yet anyway. I don’t think it’s good enough. You can buy cheap 3D printers like MakerBots, and they’re okay. They’re not like super quality, and you’re not guaranteed a clean print every time. But maybe when they get cheap enough where the ratio between quality and cost is good, then maybe. I know that my Dad wouldn’t want a 3D printer. Could you see yourself selling your pieces like you did with Toronto? Zachary Eastwood-Bloom: I don’t really want to, maybe I could do a special edition where you could download it and people could print it. But I don’t really think it’s for me. I don’t like the lack of control. I kind of like to know where my work is going and what’s going to happen to it. If 3D printing does become this thing and every house gets a 3D printer, if there’s a trade in pirate 3D files that could be interesting. Piratebay has a section of 3D object files, and I quite like the idea of some of them having visible flaws in them, like a virus, so you can end up printing objects with visible flaws to them.